The rate at which little ones grow can mean buying them clothes feels like an endless task. With the washing machine on a constant cycle, it can be tempting to nip out and buy replacements instead. But kids’ clothing is seeing a shift towards sustainability. It’s the new buzz word in fashion, and with good reason: the industry is the second most polluting in the world. Sustainability can take many forms but here we consider it as reducing the environmental impact of production processes, cutting out harmful chemicals used to make clothes, and ensuring ethical guidelines are in place when it comes to safe working practices in factories, a fair wage and so on. For mums and dads, sustainability means quality too. It means buying long-lasting, robust clothes for kids, with the potential to be handed down to future siblings. With longevity in mind, brands often incorporate features that allow garments to grow with your little one (for a few months at least), the likes of roll-up hems and adjustable shoulder straps. Top of the list for new parents and parents-to-be, though, is often the fabrics used; the safest and softest materials possible to protect delicate newborn skin. For this reason, many brands use organic cotton, produced without the use of the pesticides or chemicals that can irritate skin or exacerbate allergies. The absence of chemical fertilisers in the organic farming process also helps minimise harm to the environment. Ethics are also a top priority for many sustainable retailers. From making sure factory workers have a fair wage and safe working conditions to preventing child labour, brands go above and beyond to make sure the whole process from factory to shop floor is as transparent as possible. The easiest way to identify if your tiny tot’s clothes follow these principles are to look out for official certification, such as The Soil Association, the UK’s largest organic certification body, or World Fair Trade Organisation. Other countries will always have an equivalent body too, but brands worldwide often have to pay for such certifications. Organic cotton clothing is recognised by Global Organic Textile Standards (GOTS) or Oeko-Tex, which means no chemical pesticides or fertilisers can be used in production and farmers must work under safe conditions with an agreed minimum wage. We’ve chosen brands where either its whole range is sustainable or it has a sustainable collection. And to give you a helping hand, we’ve picked out our favourite pieces, which have all been tested on our mini testers (ranging from newborn to four years). British brand Frugi is committed to creating completely organic clothing with 90 per cent of its range now made from organic cotton. It also strives to be as ethical as possible when it comes to factory workers’ rights and pay. And that’s how it’s secured certification from GOTS and the Soil Association, which is no easy achievement. Packaging is also biodegradable and 1 per cent of profits are donated to charity each year, so all in all, it’s a great brand to support. Frugi is all about bright and cheerful designs that you know kids will love and also look adorable in. From T-shirts to tights, there are so many options to pick from, but our top choice is this cosy button-up jacket. Coming in three fun prints (animal, rain clouds and bunting), it will keep little boys and girls feeling toasty outdoors and make a great hand-me-down to future siblings. Made from certified organic cotton, it’s super soft and won’t irritate your child’s skin as they play. 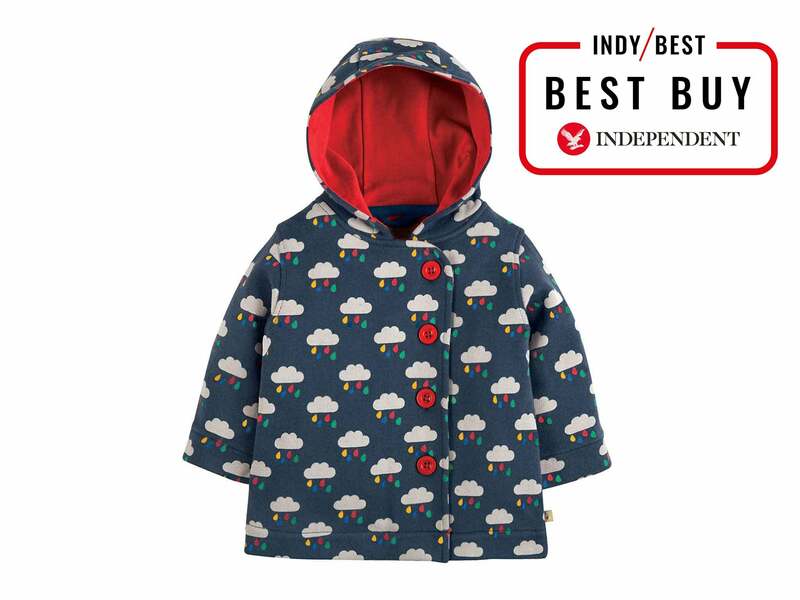 The button fastening is easy to do and undo, while the hood comes in handy during a light drizzle – although it’s not waterproof. Available in sizes newborn to four years. It’s encouraging to see a big brand like H&M doing as much as possible to become completely sustainable and ethical in the near future. Although its sustainability commitment applies to all of H&M clothing, which is to be 100 per cent renewable, with fair working practices and using sustainably sourced materials by 2030, as well as eliminating greenhouse gas emissions from its production process by 2040, currently its Conscious Kids collection is leading the way. All of it is made from sustainable materials including ones that are recycled, organic or certified by the Forest Stewardship Council (FSC), so you can feel safe in the knowledge that your little one is wearing something that has been made with the environment in mind. H&M is known for its reasonably priced clothes and its kids’ range is no different. We like this dusky-pink, organic cotton jumper from the Conscious collection available in sizes up to three years old. 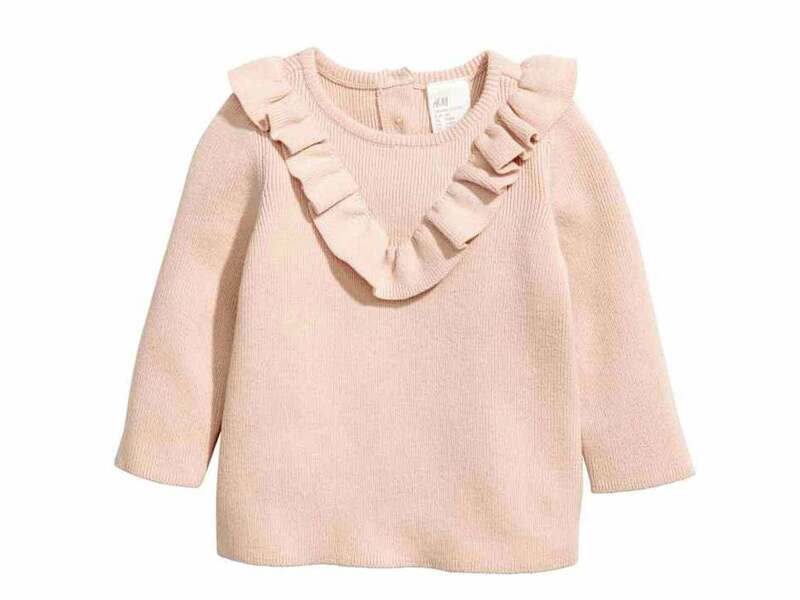 The frill motif along the front collar is on-trend and will keep your little one looking stylish in the winter months. Practically, you pull it over the head and fasten the three wooden buttons on the back. It feels soft but durable – a few tumbles won’t pull the fabric – and it’s machine washable. If this doesn’t appeal, we’d recommend taking a look at the full collection as there are lots of options for your tiny tot to wear. Piupia is a small, family-run business founded in London where the focus is on the quality of materials used and how they are sourced. The Autumn/Winter collection is made from cotton and wool. And the organic cotton is GOTS-certified, while the whole production chain and the wool used is Oeko-Tex 100 certified, so there’s a strict set of ethical and environmental guidelines in place. No chemical nasties are used to dye or print clothing and the buttons are ecological (made from cotton fibres). The production process all happens within 30km too, cutting down its environmental impact further.